Adequate food supplies and a reasonable quality of life require energy - both in commercial and non-commercial forms. 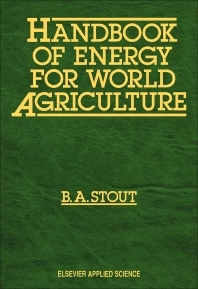 This handbook is intended as a reference for individuals who want a comprehensive overview of energy for agriculture, many of whom are located in remote areas with limited library resources. The purpose is to put energy for agriculture in perspective by presenting numerous national and regional examples of energy usage. Since the early 1970s, world petroleum prices have fluctuated from US&dollar;3/barrel to more than US&dollar;40/barrel in 1981, and then back to one-third of the peak price today. Consequently, the rural sector depends heavily on non-commercial energy sources. Availability of such energy is highly site-specific. This handbook deals extensively with non-commercial energy - its sources, the technologies for converting energy to more useful gaseous and liquid forms, and its ultimate end-uses. Photographs, tables, line drawings and graphs are used extensively. Over 600 references are listed along with agency names and addresses for obtaining further information. I. Overview. Introduction. Commercial and noncommercial energy. Energy for subsistence and development. Human energy capacity. Supplemental energy needs. Energy balance. World energy outlook. Economic considerations. Environmental considerations. Solutions to difficult problems. II. Energy Use. Introduction. Agriculture's share of commercial energy. Commercial energy use for agricultural inputs. Commercial energy use and cereal output. Commercial energy for fertilizer production and use. Commercial energy for farm machinery manufacture and use. Energy from human labor. Energy from draft animals. Commercial energy for pump irrigation equipment manufacture and operation. Commercial energy for pesticide production and application. III. Energy Flow. Introduction. Energy surveys and analyses. Regional and national examples. Small-scale hydroelectric power plants. The need for systems approach. IV. Energy Management. Introduction. Germ plasm and its impact on energy use. Fertilizer and biological nitrogen fixation. Pest control. Irrigation. Mechanization of agricultural production. Energy management in the post-harvest system. Food processing. Energy and the food consumption system. Efficient energy management in agricultural is good business. V. Energy from Biomass. Introduction. Photosynthesis. Wood for fuel. Sources and availability of biomass feedstocks. Freshwater and saltwater plants. Classification of biomass fuels. Energy profiles. Biogas. Hydrogen. Ethanol. Methanol. Vegetable oil. Biomass feedstock. Solid fuels. Summary. VI. Solar Energy. Fundamentals of solar energy. Collection and storage. Agricultural applications. Future potential of solar energy. VII. Wind Energy. Introduction. Fundamentals of wind power. Wind energy conversion systems. Wind system applications. Wind characteristics. Feasibility studies. Economics. VIII. Hydropower. Introduction. Fundamentals of hydropower. Hydropower potential. Classification of hydropower plants. Reasons to consider small hydropower stations. Planning a hydropower project. The hydroelectric power system. Cost of a small hydroelectric plant. Small hydropower stations versus other alternative sources. Examples of hydropower end uses. Observations on the status of hydropower. Summary. IX. Alternatives. Introduction. Energy options. A framework for policy assessment and formulation. Increasing the energy supply. Decreasing energy demand through efficient management. Policy implications. Research needs. Technology assessment. The Indian Energy Center: a model for developing countries. Summary. Appendix 1 - Sources of further information. Appendix 2 - Conversion of units. Index.